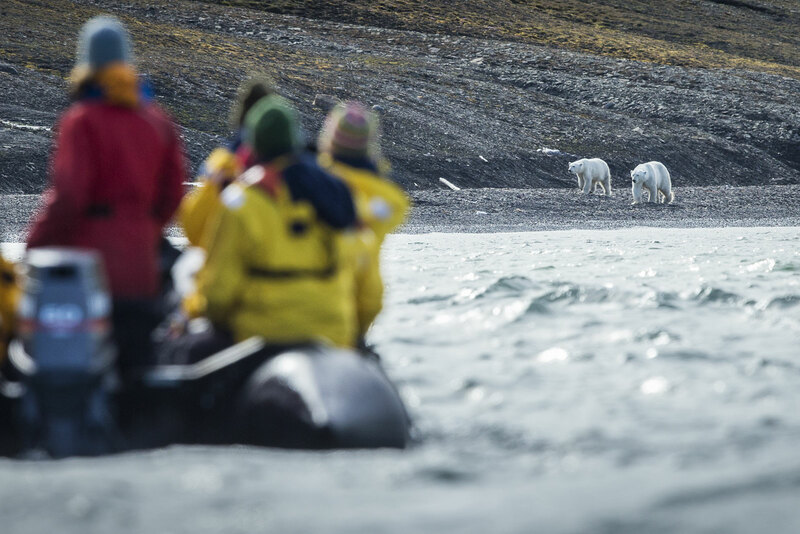 • Spend eight landing days on one of the planet’s most hidden and seldom visited wildlife destinations, the northernmost archipelago in Eurasia. • Discover some of the world’s most dense populations of polar bears and walruses. • Ice, seascape, and landscape photography with dramatic lighting and arctic intensity. • Participate in citizen science alongside a team of international marine scientists. • Our 14 leaders are polar specialists, photographers, scientists, and naturalists who will provide lectures, workshops, and guided excursions. • Optionally, go on guided kayaking excursions (costs extra). • Begin your journey early on our Finland: Boreal Wilds safaris from July 5 to 17, 2019, where you’ll have exceptional opportunities to photograph wolverines, brown bears, and hopefully gray wolves prior to joining our expedition to Franz Josef Land. View full itineraries for Finland I and Finland II. Jul 18 Travel to Norway from one of our Finland safaris - Finland I or Finland II - or from home. Born in a small coastal town in the Netherlands, Ab started birdwatching at a very young age and grew up surveying breeding bird populations in the dunes around his hometown. Ab managed the landscape for the Dutch Royal Family for over 15 years while using his arborist skills as a climber to help with owl research. He also served as a volunteer crewmember with the Royal Dutch Lifeboat Association for more than 10 years, bringing rigor and resourcefulness to their Zodiac crew. 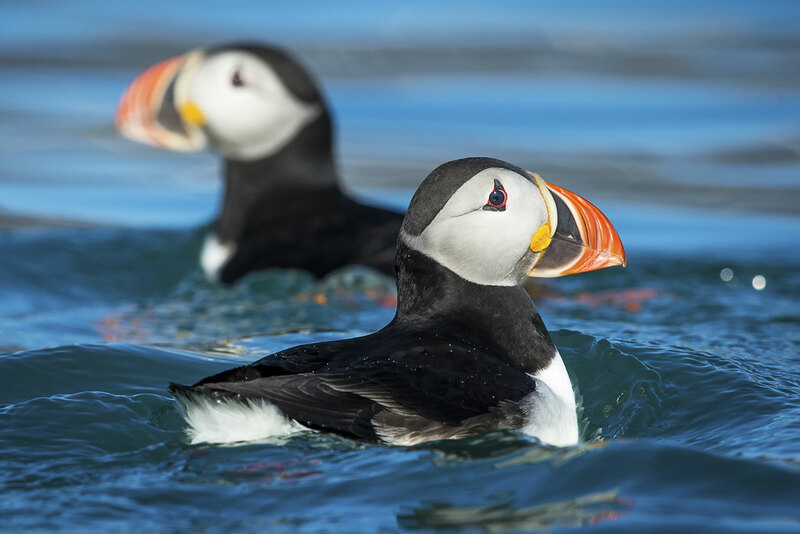 We challenge you to stump Ab with any arctic ornithology question. Bart is a professional landscape photographer from Belgium who specializes in the use of light and ambiance. For years he was an impassioned ornithologist and he made the logical transition from binoculars to camera. Bart gives weekly workshops and lectures to amateur and advanced photographers, both in Belgium and abroad, and organizes many international photo tours. Recently, he won several national and international photo contests and his images were displayed in the Mall Galleries and projected onto the National Theatre in London. Phil directs the Cetacean Assessment and Ecology Program at the NOAA’s Marine Mammal Laboratory in Seattle, where studies range from Harbor Porpoises to Blue Whales; his own primary research interests relate to the population biology, behavioral ecology and conservation management of large whales. Phil has previously directed large whale research at the Northeast Fisheries Science Center in Woods Hole, Massachusetts and remains a Research Associate with the Smithsonian Institution (National Museum of Natural History) in Washington DC. He holds a Ph.D. in zoology from the University of Aberdeen (Scotland), and conducted post-doctoral work in genetics at Cambridge University and at the University of Copenhagen. Over the past thirty years, he has advised several governments and other bodies on whale research and conservation. Yulia is a Research Associate with NOAA’s Marine Mammal Laboratory in Seattle. She currently works on historical studies of whaling, and also uses whaling data to facilitate assessments of the status of whale populations today. Yulia has published detailed investigations of Soviet illegal whaling, and has played a key role in correcting the Soviet whaling catch record in the North Pacific. She also recently exposed extensive illegal catches by Japan in the 1960's. Russian by birth, Yulia holds a Ph.D. from Southern Cross University in Australia. In addition to her historical research, she has studied whales in various locations including Alaska, the Caribbean, the South Pacific and the Russian Far East. She is a member of the U.S. delegation to the International Whaling Commission’s Scientific Committee. John hails from the world's southernmost capital, Wellington, New Zealand. Growing up surrounded by the natural beauty of New Zealand, his character and foray into photography were shaped by his environment. Starting out as a casual hobby from a young age, John's work soon developed into a passionate pursuit to become a nature and travel photographer. As New Zealand's most prominent landscape and wildlife photographer on the Instagram platform, John enjoys connecting with a global community of photographers and teaching others how to better their own photography skills. For John, creating curated imagery has become a way to communicate a message, capture beautiful moments, and share unique experiences with the world. Travel to Norway from one of our Finland safaris - Finland I or Finland II - or from home. The Sea Spirit is an “all-suite” luxury vessel built for sailing in ice with an ice-strengthened hull and retractable fin stabilizers. All the cabins have a private, en-suite bathroom, a lounge area, ample storage, and a television with DVD player, plus unobstructed exterior views via portholes, picture windows, or a private balcony. The ship is outfitted with a presentation room for onboard lectures, Internet access, a gym, library, game room, lounge, bar with bartender, and dining lounge with chef-prepared meals.The Sea Spirit carries a fleet of ten Zodiacs for your excursions, driven by our own experienced leaders. Located at the rear of the ship, the Zodiac loading area provides a safe and relatively sheltered place from which to embark on your adventures. The Sea Spirit also carries a fleet of sea kayaks for excursions, weather permitting. Transfers from the airport to the hotel on July 19, from the hotel to the ship on July 20, and from the ship to the hotel/airport on August 2. Water-resistant parka – yours to keep. Guided kayaking, which must be arranged before the expedition (costs $655 per person). Gratuities – tipping is, of course, discretionary, however we suggest budgeting about $22 to $25 per participant per day for July 20 to August 2 aboard the Sea Spirit (about $308 to $350 total per participant). Franz Josef Land is locked in ice most of the year, but in late summer sees enough open water from the last influence of the Gulf Stream. The climate, consequently, will hover around freezing, sometimes well above on calm, windless days but generally in the range of 25 to 40°F (-5 to 5°C). Penetrating cold is not usually a problem, though be prepared for wind chill and potential wetness from splash while riding in Zodiacs. It is also possible to get wet weather, but often it is with wind, so an umbrella is not usually practical. Waterproof gloves, warm cap, layers of light, loose, warm clothing, and water-repellent outer garments are necessary. Sunscreen is critical. The temperature on the ship is comfortably warm, but you may still wish to dress in layers and keep a warm layer handy in case there is exciting wildlife (such as a polar bear or bowhead whale!) to watch from the ship’s deck. Flights you (or a travel agent) book: Arrive in Longyearbyen, Svalbard (LYR) on July 19 (for most, this means departing home on July 17 or 18). If you are arriving from our Finland safari, see Flights section in that itinerary for arrival information. Depart Longyearbyen, Svalbard (LYR) after 8:00am on August 2. Don’t let a fear of seasickness scare you away! For all but the most sensitive, seasickness is rarely a problem in this region. Svalbard and Franz Josef Land are on the European continental shelf, limiting the scale of open ocean swell (this is NOT the Drake Passage). The majority of the voyage will be within the sheltered waters of the Franz Josef Land archipelago, but swells are possible during the crossings to and from Franz Josef Land. It’s a good idea to bring medication if you get seasick or are unsure, but you may find that you do not need it after a couple days once you have your “sea legs.” Even those who have experienced seasickness reported that the incredible wildlife and overall experience were well worth the temporary discomfort. Read our suggestions for coping with seasickness and contact us if you have any concerns. "Cheesemans' delivered what they said they would - provided maximum time in the field with qualified leaders and guides well experienced in tracking, anticipating and explaining wildlife behavior." "Hugh Rose is a world-class guide and educator representing a world-class company." "Scott Davis was awesome! He helped me so much with my photography, and was always ready to answer questions with a great outgoing personality." "Ted Cheeseman is the greatest! He runs a fantastic trip, always getting the best for each participant. He is knowledgeable, approachable, and completely genuine. I would go anywhere with him!"